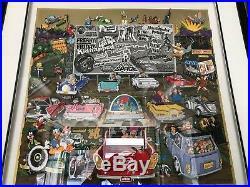 "Disney At The Drive In" Signed and numbered in limited edition (3-D) Construction by CHARLES FAZZINO. PR Edition # 50 /325. Image Size : 221/4" x 23". Outside Frame Size approx 32" x 33". FRAMED IN A 2 INCH SHINNY MICA BLACK WOOD FRAME. A Certificate of Authenticity (COA) from Fazzino included. 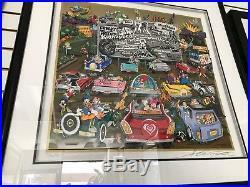 The item "Charles Fazzino Disney At The Drive In 3-D Artwork Signed & Number Framed" is in sale since Monday, April 9, 2018.